Badger State Ethanol, LLC is pleased to announce its association with FNC Ag Stock, LLC, a registered broker-dealer, for the purpose of trading BSE Capital Units of stock. The only stock currently available for purchase is through existing BSE shareholders. The Company does not anticipate issuing additional stock anytime in the near future. FNC Ag Stock displays our A Stock and A1 Stock that posts available listings, recent sales and standing offers to purchase. Prospective sellers need to call FNC Ag Stock at (701) 780-2828 or (855) 827-7391, and visit with a Registered Representative to prepare a Listing Agreement. Once the Listing Agreement is signed and returned to FNC Ag Stock, the 15-day waiting period begins. Prospective buyers need to call FNC Ag Stock and have them input their Standing Offer to Purchase (bid) on the website. Once a match is made, FNC Ag Stock will assist in all paperwork that needs to be signed by both the seller and buyer and make sure that it is completed in a timely manner. All funds for transfers are held in an accredited Escrow Agent account. FNC Ag Stock will assist in the funds being deposited into the Escrow account prior to the transfer documents being delivered to Badger State Ethanol for approval. Capital units must be posted to the website for a minimum of 15 days. After the 15-day period, capital units will be matched with eligible buyers. Transfer documents will be sent out by FNC Ag Stock once a match is made. Under this system, there is a 3% sellers' fee charge, with a $250 minimum, that is reduced from the sale proceeds. All trades will become effective on the first day of the following quarter. Investors have no grain delivery requirement at Badger State Ethanol. 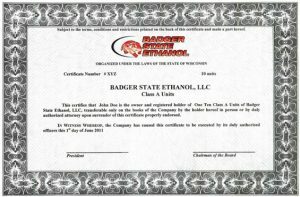 New member investors must download and read the Badger State Ethanol Operating Agreement and then print, fill out and sign the following documents once a successful match has occurred. Trading will be conducted on a quarterly basis with some very important dates that must be kept in mind. Please see the quarter timetable below, which outlines the important dates during the trading year. * Dates are provided only for guidance and therefore may vary. The actual deadline to submit is 45 days prior to the end of each quarter. ** May be waived in FNC's discretion if other sale conditions met. . Please check out the website, www.fncagstock.com and become familiar with the procedure. If you do not have access to a computer or are not comfortable using a computer, please give us a call.